In the fall of 1993, Wild Wing introduced the Avocet. Designed as a signature course by Larry Nelson, two-time PGA Champion and 1983 US Open Winner, and Jeff Brauer, the Avocet is a course where each hole is memorable for its enjoyment, aesthetics, and playability. 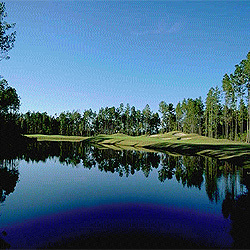 All 18 holes are challenging, but fair tests of the player's skills. Creative contouring presents elevated tees and greens, double fairways, grass bunkers, and even a double green serving two holes. Water plays a strategic role in the design of the Avocet and with all Par 5's and Par 3's orienting to different points on the compass, each season's prevailing winds come into play. Multiple tees on each hole offer endless and ever changing challenges. The Avocet was recognized by Golf Digest as one of "The Top 10 Best New Resort Courses in America" for 1994.